This P320 M17 commercial variant has an ambidextrous thumb safety, coyote tan frame and slide, 4.7 in barrel, black controls, and ships with two 17rd magazines. Standard production commercial M17 variant with 4.7" barrel, coyote tan finish, SIGLite night sights with DP Pro Plate, two 17rd magazines and includes thumb safety. The controls (safety, trigger, slide catch lever) are black. This will be the most similar model to the military M17 aside from the commemorative limited edition model. 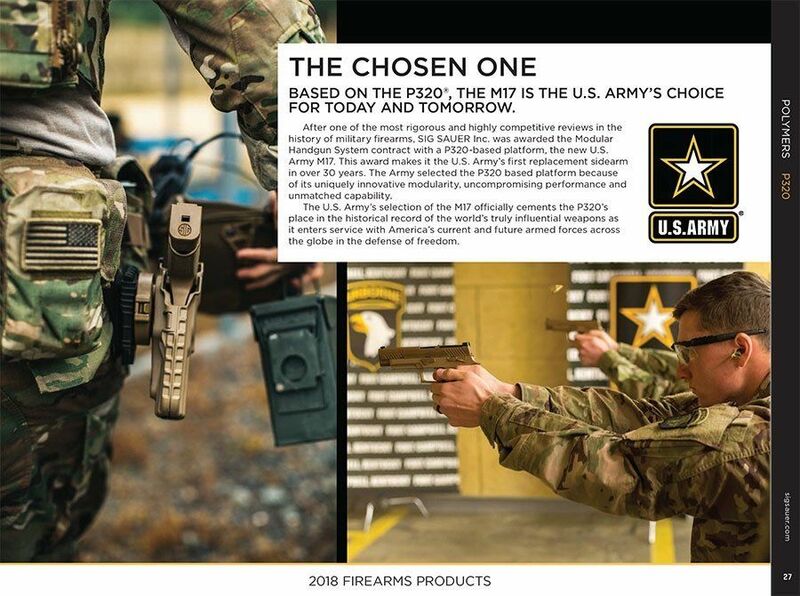 Does this product qualify for Sig’s LE/MIL discount program? We are still waiting for an updated price list for the APP program as of this response (7-20-18). 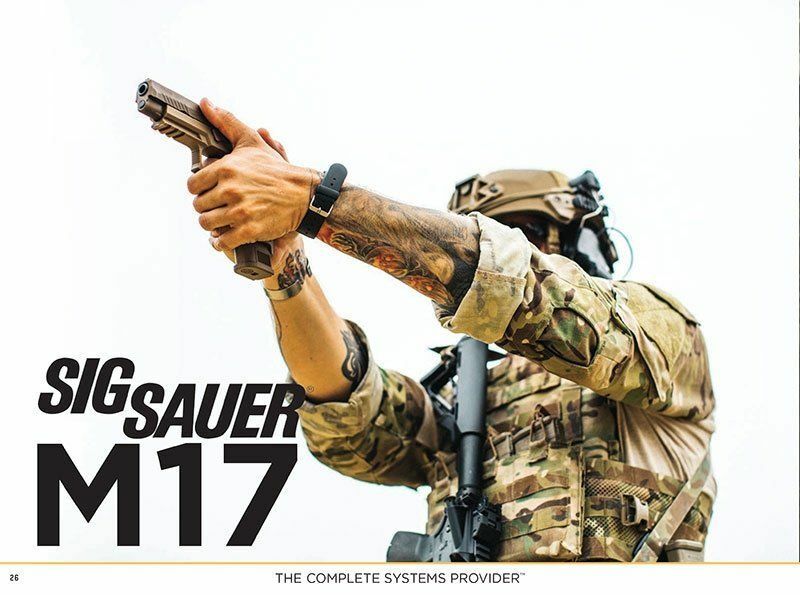 We hope that Sig will offer the M17 in the near future but we commonly see a 6 month delay between commercial releases and APP release. We will list the model on our APP dedicated site, www.thesigapp.com, if / when it becomes available. Would like to purchase Sig army release as soon as available. I can send deposit if. You wish..
Will this be offered with an option for 10rd magazines? Sig is not currently (as of 7-23-2018) offering a variant with 10rd magazines. We try our best to keep 10rd magazines in stock for the various P320 sizes and can swap the firearm's mags to 10rd magaiznes if we have the proper 10rd magazines in stock. We normally charge $10 per magazine for the swap because we sell the open box magazines (from swaps) at a discount. We recommend giving us a call if you'd like to verify availability of the magazines or if you'd like to place an order. Our site is set up to restrict sales into states that have magazine capacity restrictions. Hi, I saw you did a wait list for the commemorative M17, are you doing a wait list for the commercial version? We are going to start a pre-order but we're waiting until the ship dates for this model are firmed up a little more. We expect them to ship in the middle of August but we're wanting to ensure that is accurate. You can add your email address to the product page for a stock notification and it will send an email once we start the pre-order. After initial shipments are received (and back out of stock), an email can be entered if you want a subsequent email notification. Can the slide be racked with the thumb safety on? Sig's P320 pistols equipped with manual safety can be racked with the safety engaged. Is the standard commercial version going to be a regular production firearm or will it be limited edition only? The M17 Commercial model is going to be a standard production model. Is this cut for a Romeo optic or Delta Point like the official MHS pistol? The commercial P320 M17 will accept the Delta Point Pro as well as Sig's Romeo1. This specific variant is not part of the limited Commemorative release of 5,000. This is production model. The part number for the Commemorative version is M17-Commemorative. Is the Sig P320 M17 handgun legal in California? The M17 is not currently listed on California's roster of approved handguns. Only those exempted from the list would be able to purchase (law enforcement is exempt). Are the Commercial M17 with black controls (with manual safety) also going to be limited in quantity or will they be around for a while? The P320 M17 commercial model is slated for standard production. It should not be a limited run. The M17 commercial edition with manual safety should be available for some time. It is in Sig's standard lineup.